With Yours.org you can earn Bitcoin Cash depending on what you post! If you're just getting started with Bitcoin Cash and want to learn more, visit https://www.yours.org/content/bitcoin-cash-starter-kit---guide-to-begin-using-bitcoin-cash-a6829cea11d5 and read through the Bitcoin Cash guide or visit http://startbch.com. With Open Bazaar, the entire world is your market. Anyone globally can buy what you post for sale on http://OpenBazaar.org Open Bazaar is "a free online marketplace." It features no platform fees and no restrictions. Users are free to buy and sell freely anywhere in the world. It has a client for Windows/Mac/Linux. Ebooks, Videos, Music, Graphics, Infographics, Code, Templates, Technical Documents, Manuals, Guides, etc. Sell your digital stuff using rocketr.net - here's a professional looking example buy page: https://rocketr.net/buy/example - or you can sell it right here on Yours.org under Art / Music / Photos, etc! We will attempt to help support every creator who publishes well written, informative Bitcoin Cash educational information and media (video/graphics/media projects) here on Yours.org that helps people understand and get started with Bitcoin Cash and Yours.org - with your permission (and credit), we will republish any media you created on social networks including r/btc, such as this Bitcoin Cash Demo film created by User: http://yours.org/@cain - we will also try to provide extra support if you mention the humanitarian effort Manna Currency. There's also /r/BCHBazaar - you can post anything there for sale, such as your freelance work, used items or trade items, product that you produce and can ship. Give it a try! OR, if you have the time and something to sell, setup a woocommerce wordpress website and choose a BCH plugin/extension, there's easy-to-follow instructions on https://gourl.io/bitcoin-wordpress-plugin.html - it works great! Manna is Universal Basic Income + Blockchain. New Manna is sent to every registered individual every single week! Register now at http://MannaBase.com to collect Manna to later exchange for Bitcoin Cash! There are many global exchanges now. We know this is popular, and most people just buy Bitcoin Cash, however, we don't really recommend day trading unless you have a lot of experience doing so. One way to buy Bitcoin Cash is through an exchange service like Uphold.com, where you can transfer from PayPal.com for example. Be careful doing this, as if you are transferring between accounts there is a risk of losing your funds. It is highly advisable to check with your bank before doing this as many banks will close down your account for buying Bitcoin Cash and other cryptocurrencies. You can now earn Bitcoin Cash at https://localbitcoincash.org > Menu > Earn Bitcoin Cash. Here you will find a listing of opportunities requested. Note however that it is a very new website and it will take some time for new listings to appear. If you are looking to offer an opportunity make sure you list it here to help the tool grow. People can earn Bitcoin Cash by going to https://localbitcoincash.org > Menu > Earn Bitcoin Cash to access all the different ways to earn BCH. LocalBitcoinCash is still a very new site at just 6 months old so it will take a while for more opportunities to populate up on the site. Another one to add to the list is Hashmonster. New place that gives you some free cloud mining just for signing up. Could just be another Ponzi cloud scheme tho so I wouldn't put your BTC into it. Free mining is still free mining though and they are currently allowing you to withdraw. Then exchange to BCH. Link below for anyone that wants it, as its a referral link you get a free 5% hash power on top of the sign up free stuff. Do not buy hash power unless your willing to risk a Ponzi scheme though. 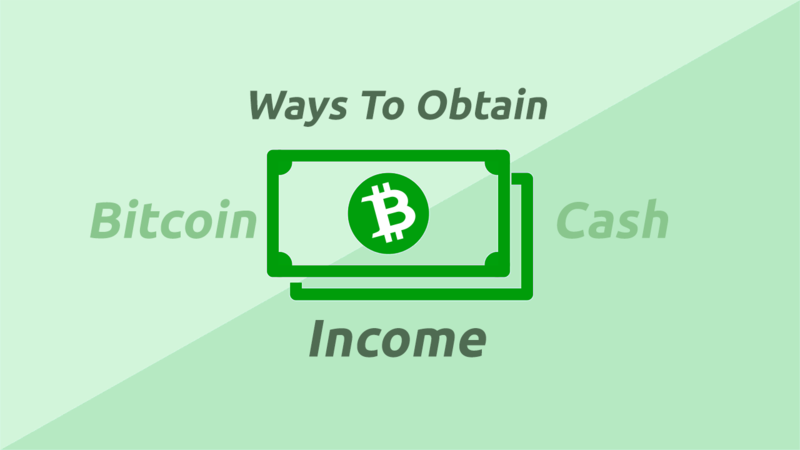 People can earn Bitcoin Cash by going to https://localbitcoincash.org > Menu > Earn Bitcoin Cash to access all the different ways to earn BCH.